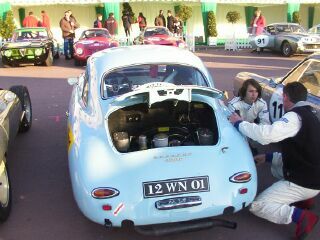 Pour continuer sur le Tour Auto 2003, voici quelques lignes sur cette épreuve prestigieuse, notamment en anglais pour les lecteurs anglo-saxons, retraçant l'ambiance et le plateau prestigieux. Traction : Une 11 B de 1955 Citroën était parmi les équipages avec l'équipage Barbier/Laniray. Chrysler : Qui présentait en avant première en France la Crossfire sur l'espace V.I.P. du Tour Auto. La S300 est la première voiture de série à fournir 300 cv sur V8 culbuté, une sportive qui rappelle celle vue aux U.S.A. au championnat Nascar. Quelques Chrysler d'époque étaient également de la partie, dont une 300 B pilotée par Raphaël BRUNET. 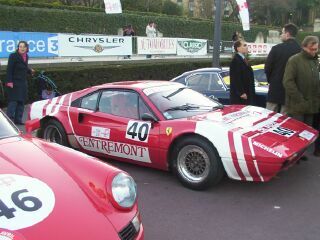 Before Cannes Festival and the world Formula One champion ship in Monaco, the French Tour Classic was this year a large participation for exceptional car of legend. In last minute, Patrick PETER (Peter Auto Organisation) have given a large place in this competition at Matra legend (this year is the end of this cars and the death of Jean Luc Lagardere, the Matra founder : It was a participation of the winner of the 1970 French Tour, with a special Matra MS 650 driving by Jean Pierre BELTOISE and Henri PESCAROLO. 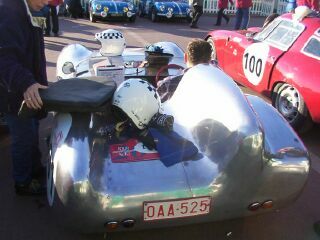 The MS 650 will be stopped after Dijon on this competition in direction from Dijon-Prenois after a large success on the road from Paris, before the Eiffel Turm and Trocadero gardens. An other legend car was present with the LIGIER JS2 from Guy LIGIER, the manufacturer of Vichy (you can visit on this site the LIGIER Museum in Magny Cours), the final version "Le Mans" will appear in the 2003 Tour Auto (With a Cosworth 3 liter-engine driving in 1975 by Jean-Louis LAFOSSE and Guy CHASSEUIL after a modification : The vehicule was equiped with V8 Maserati 450 hp in 1974. 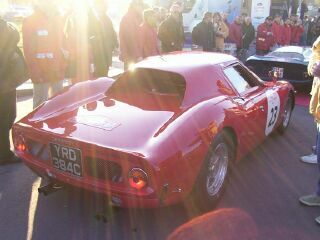 This is neither the first appearence of Brandon Wang's Ferrari GTO 4219. 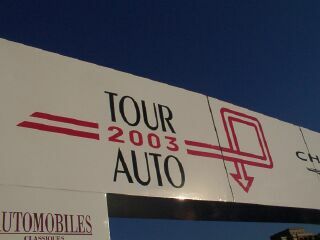 The chinese businessman was soon become in 2001 with success in Tour Auto. Five FORD GT40, one Alfa 33 with JF BENTZ naviged by Hervé POULAIN, one RENAULT GORDINI 24S (ex. 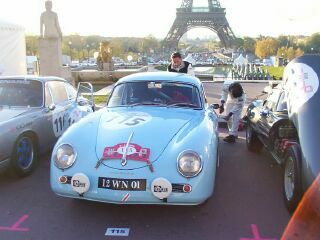 Françoise SAGAN) : The car has participed for the first time in the Tour de France Auto fifty years ago. 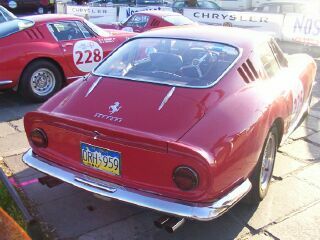 On the paddock front we can see some nice FERRARI like 250 GT Berlinette, winner in 57th Tour Auto, the Entremont's 308 Gr IV Michelotto, the 365 GTB4. 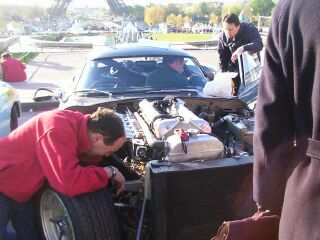 One AUSTIN ex Stirling MOSS, one Ford Mustang ex SMET (the french singer and actor Johnny HALLIDAY)... for the pleasure on the race from Dijon - Charade/Clermont Ferrand and Ledenon/Nimes in Sud of France.